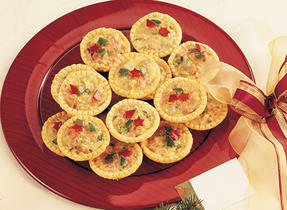 Serving something warm with cocktails or as a first course sets a comforting seasonal tone. Firm cheeses like Gruyere and Monterey Jack make great additions to soups. Find more great matches for your favourite cheeses. In a large skillet, melt butter on medium heat. Sauté onion and garlic for 2 minutes. Add rice and stir thoroughly to coat the grains with butter. Deglaze with white wine and reduce by half. Pour broth into skillet and add herbs. Cover and let simmer 15 minutes. Remove lid, stir and cook another 5 minutes uncovered to allow any excess liquid to evaporate. Remove bay leaf, add Cheddar and season with salt and pepper. Let cool and then chill completely in the refrigerator for at least 1 hour. Take a Cheddar cube and completely coat with cold risotto. Shape into a ball with your hands. Repeat until all the mixture has been used (24 balls). Place flour on a plate and add salt and pepper to taste. In a bowl, beat eggs with a little water. In another bowl, mix bread crumbs, Parmesan and parsley. Dip the risotto balls in flour, dip in egg mixture, drain well and then coat with bread crumbs. Dip a second time in egg mixture and coat again with bread crumbs. Place arancini on a baking sheet covered with parchment paper. 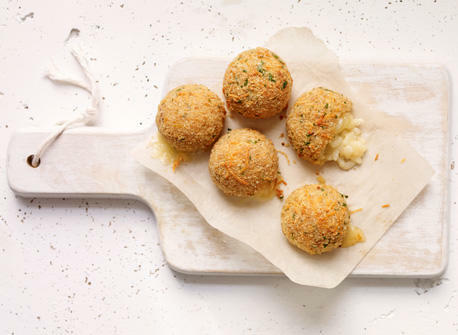 Brush each arancini with melted butter and bake 15–20 minutes or until golden and crispy. Serve immediately. Risotto can be prepared the day before. Arancini can be frozen before or after baking. Cheese alternatives for Aged Cheddar: Canadian Provolone, Gouda. 116 people love this recipe.